The Satake Milling Separator SFI is an all-purpose separator for the cleaning of cereal grains, such as rice, wheat, maize, soya, rye, oats, etc. 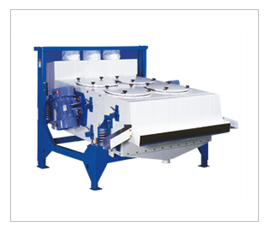 The oscillation of the double deck sieves efficiently removes both large or coarse material, and fine impurities from the grain being efficient removed. The SFI is available as a Silo rice (elevator) Intake Separator for high Capacities and as a Milling Separator, to provide more precise separation. The SFI can be used with a simple exhaust or can be matched to either a SCA Closed Circuit Aspirator or an open circuit aspirator. Robust construction with low maintenance requirements.